It’s an achievement and also somewhat of a relief to complete the book. We both found it hard to get into and probably wouldn’t have read it if it wasn’t for the book group. Part of the difficulty is that there are so many references to the people of the time, both in politics and society in general, that without some background in the period you begin to flounder and the eyes glaze over. Other members of the group had found the same. But if you like reading historical and biographical books don’t let this put you off. There are fascinating insights into family life in the late 18th/early 19th centuries, references to the French Revolution and its effect in England, visits to Yorkshire, the Lake District, Buxton (to take the water and endure the ‘horrible treatment of Skin Rotations‘ – a massage bath lying on a flat dish of copper), and to Bath, to mention but a few. The main cause and aim of Wilberforce’s life was the abolition of the slave trade and the end of slavery itself. He also wanted to remake England by reforming the morals, attitudes and fashions of the nation. The majority of the book is made up of the account of the twenty years struggle to end the slave trade through legislation, culminating in the passing of the Act of Abolition in March 1807. This made the slave trade illegal throughout the British Empire. In America also an Act of Congress outlawed the slave trade. He was as restless and volatile as a child himself and during the long and grave discussions that went on between him and my father and others, he was most thankful to refresh himself by throwing a ball or a bunch of flowers at me, or opening the glass door and going off with me for a race on the lawn ‘˜to warm his feet’. 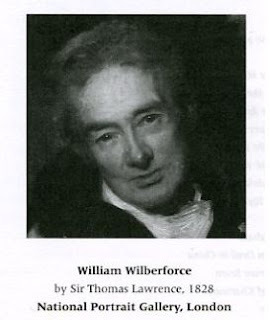 I knew one of my first lessons was that I must never disturb Papa when he was talking or reading, but no such prohibition existed with Mr Wilberforce. His love for, and enjoyment in, all children was remarkable. He was buried on 3 August 1833 in Westminster Abbey. Thousands of Londoners mourned. Two royal dukes, the Lord Chancellor, the Speaker and four peers supported the Pall. Members of both Houses walked in the procession. ‘The attendance was very great’, recorded a Member in his diary that night. ‘The funeral itself with the exception of the Choir of the Abbey perfectly plain. The noblest and most fitting testimony to the estimation of the man. I love the thought of only travelling or discussing politics in an emergency! I could make a virtue out of that kind of life!